Tenable.io® provides the actionable and accurate data you need to identify, investigate, and prioritize the remediation of vulnerabilities and misconfigurations in your modern IT environment. PREDICTIVE PRIORITIZATION IS NOW AVAILABLE ON TENABLE.IO! Your IT landscape is rapidly evolving, and your vulnerability management strategy needs to evolve too. Organizations are embracing new virtual and cloud assets such as containers. Mobile devices increasingly come and go from networks. Periodic scanning of traditional assets is no longer enough to deliver the necessary visibility and insight. Tenable.io provides the most accurate information about all your assets and vulnerabilities in your ever-changing IT environment. 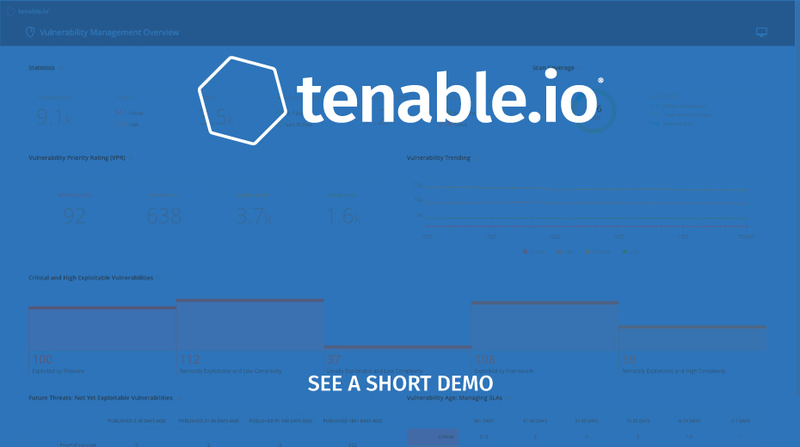 Available as a cloud-delivered solution, Tenable.io features the broadest vulnerability coverage, intuitive dashboard visualizations for rapid analysis, and seamless integrations that help you maximize efficiency and increase effectiveness. Use the included Nessus sensors for active and agent scanning, as well as passive network monitoring, to gain full visibility into your attack surface spanning on-prem through public cloud. Remediate what matters most by combining vulnerability data, threat intelligence, and data science to identify vulnerabilities that have the highest impact to your organization. Track assets and their vulnerabilities with unsurpassed accuracy – even highly dynamic IT assets like mobile devices, virtual machines and cloud instances. Monitor network traffic continuously to detect and assess short-lived systems and hard-to-scan devices, such as sensitive OT and IoT systems. Achieve continuous visibility and assessment into public cloud environments through our Amazon Web Services, Microsoft Azure and Google Cloud Platform (GCP) Connectors. Automate workflows and the sharing of Tenable.io data with third-party systems through pre-built integrations, well-documented APIs and SDK resources. See for yourself at developer.tenable.com. Provides 32% greater vulnerability assessment coverage than competitors, with more than 109,000 plugins across both applications and operating systems. Accelerates security risk assessment to quickly identify vulnerabilities and misconfigurations. Security analysts can run their initial assessments in less than 5 minutes. Benefit from clear, actionable dashboards and essential predictive prioritization insights to focus first on the 3% of vulnerabilities that matter most.